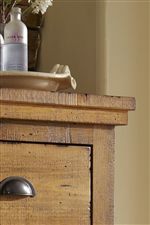 The wide plank slats of this headboard present a rustic appeal for your master bedroom. Constructed of distressed pine for vintage character, the headboard boasts substantial style with its rough hewn pine solids and mitered frame. From a casual to an eclectic decor, this headboard creates a refreshing look in your home. Complete with a bed frame (sold separately). Depth varies by finish. Distressed Dark Gray, 3"D; Distressed Pine, Distressed White, Distressed Black, 4"D.
The Willow Queen Slat Headboard with Distressed Pine Frame by Progressive Furniture at Conlin's Furniture in the Montana, North Dakota, South Dakota, Minnesota, and Wyoming area. Product availability may vary. Contact us for the most current availability on this product. 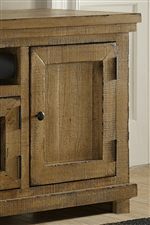 The Willow collection is a great option if you are looking for Rustic Casual furniture in the Montana, North Dakota, South Dakota, Minnesota, and Wyoming area. 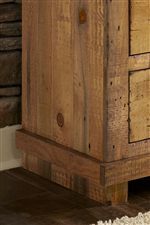 Browse other items in the Willow collection from Conlin's Furniture in the Montana, North Dakota, South Dakota, Minnesota, and Wyoming area.